In the Walt Disney film Mulan, "Cri-kee" the cricket is considered to be a lucky charm for Mulan's family. The idea was based on the traditional Chinese custom of keeping crickets in cages in the home for luck. Many Native American tribes also thought that crickets brought good luck, and the belief holds true for many Americans. There are still those who believe that it is bad luck to kill a cricket in the house or harm a cricket at all! Despite those beliefs, the incessant chirping of a cricket in one's home can quickly become annoying, especially because they only seem to go quiet when the search for them begins. In fact, that was one of the very reasons that the Chinese kept crickets in their homes. The insects acted as a sort of home security system in that they stopped chirping when a person approached—its silence gave an alert that someone was coming. 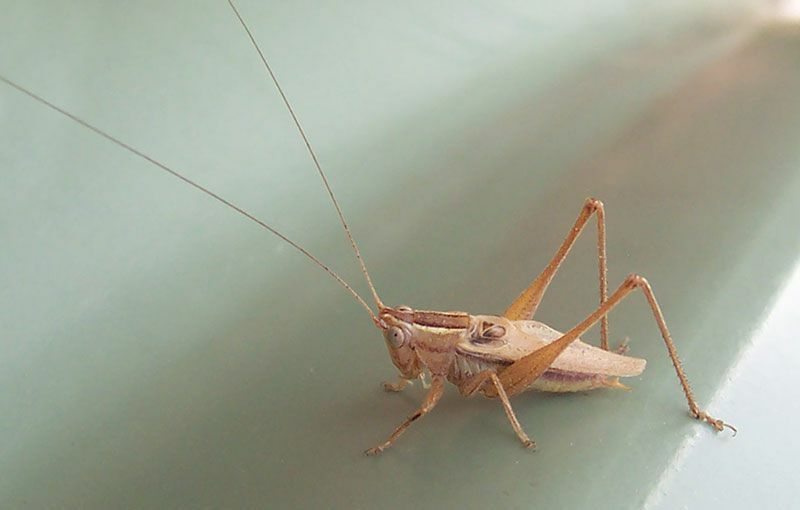 But if you already have a home security system, or prefer not to have them underfoot (caged or not), the rest of this article discusses two common cricket species, how to get them out of the house, and how to keep them out. Like millipedes and centipedes, crickets are considered to be only occasional invaders of homes and other buildings. That is because they prefer to live outdoors and don't survive well or breed indoors. However, they will enter structures in search of shelter if the weather gets bad or if they just accidentally happen to hop through a door, window, or other opening. Because crickets are attracted to warmth, they are most likely to be found in kitchens or near sources of heat, such as the furnace or water heater. Once inside, they can burrow into cracks and behind baseboards. About 3/4 to 1 inch long. Has a light yellowish-brown body with three dark bands on the head and long, pointed wings. Will chew on and damage fabrics, paper, rubber, and foods. 1/2 to 3/4 inch long. Has a dark brown to black body with curved wings. Feeds on plants and fabrics. Is attracted to lights at night. A cricket or two in the home will rarely cause damage, but high populations can be of concern because of their tendency to chew. If there are just one or two, place glue boards in the areas of the room where chirping is heard. Use cornmeal in the center of the board as bait, and the cricket should be captured within a day or two. If the cricket can be found, it can be vacuumed up. The vacuum should then be emptied, or the bag thrown away, outside the home. Spray pesticides can be applied to entry points, baseboards, and in garage and basement areas. Baits can be placed in non-food areas. But when using any chemical (spray and bait traps alike), be sure to purchase only those labeled for the insect you want to control and the area it is to be used, then read and follow all label directions. Caulk or seal all potential entry points, such as cracks in the foundation and gaps around doors and low windows. Never store firewood or other organic material or debris near the home—crickets and other pests can use the wood for shelter and then make their way into the home. Reduce harborage by setting trash cans up on bricks. Use yellow sodium-vapor lighting outdoors rather than white or mercury vapor lights. When possible, place lights on poles with the lighting directed toward the door or area you wish to light. This will draw insects to the light source rather than to your opening door. Inside the home, reduce clutter, piles, etc. to reduce potential harborage and hiding areas.